Artists for Haiti at Track 16 Gallery Thursday, January 28th, 2010 - Yo! Venice! 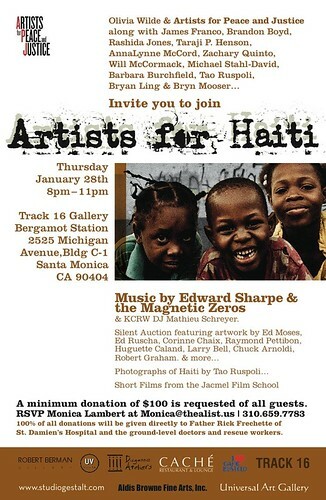 Olivia Wilde & Artists for Peace and Justice along with James Franco, Brandon Boyd, Rashida Jones, Taraji P. Henson, AnnaLynne McCord, Zachary Quinto, Will McCormack, Michael Stahl-David, Barbara Burchfield, Tao Ruspoli & Bryn Mooser Invite you to join Artists for Haiti. Featuring music by Edward Sharpe & the Magnetic Zeros & KCRW DJ Mathieu Schreyer. Photographs of Haiti by Tao Ruspoli and Short Films from the Jacmel Film School.